You KNOW your intentions are good when it comes to sending cards to celebrate birthdays and anniversaries. You WISH you had just the perfect card on hand when condolences or get well wishes are in order. You REGRET missing an opportunity to let someone you care for realize that you’re thinking of them and value their friendship. This is why, in my opinion, EVERYONE should have an ALL OCCASION ASSORTMENT BOX on hand. You’ll never again have to flounder around looking for just the right card. It will be right there at your fingertips, in the sturdy and colorful box that keeps them fresh and clean and at your disposal. No more last minute trips to the store to pick up a card, or time spent going through the racks to find an appropriate one. In this nicely organized box, there will be a matching envelope for each card – even a few extra – and they’ll have those wonderfully convenient self-adhesive peel strips. There are two assortments to choose from – Box 1 and Box 2. 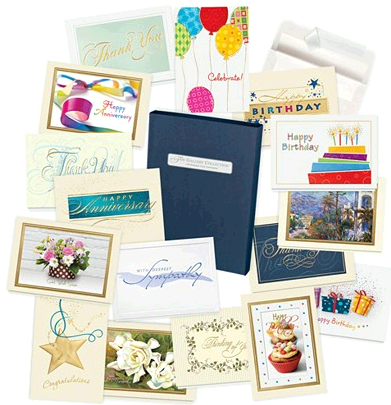 They both have an excellent variety of cards including Birthday, Anniversary, Get Well, Sympathy, Thank You, Congratulations and Thinking of You, along with a few blank Notecards which have proved very useful to us. Each of the boxes has the same set-up but with different designs. We keep one of each on hand and find we NEVER have to waste time running to the store for cards. With the beautiful designs and excellent card quality, we’ve had so many compliments on the cards we’ve sent that for us, the All Occasion Assortment Box is indispensable. The Gallery Collection’s Assortment Box has saved the day for me on numerous occasions. It is a must-have item – I don’t ever want to be caught without one on hand. I know if an occasion pops up, which they always do, I always have a classy, fine quality card to give or send, be it a Thank You, Birthday, Anniversary, etc. – or even for the sad occurrence of a death. The Gallery Collection cards are the nicest cards you will find. I always receive high praise from anyone who receives one from me. I would be lost without this product.. Thank goodness for The Gallery Collection. The price per card is definitely worth it. I have one of these boxes for myself and it has saved me so many trips to the card store. Would definitely recommend to anyone, the cards are beautiful and high quality. I agree that these are a MUST! Saved me from so many forgotten moments at work. I ordered an all occasion assortment box from The Gallery Collection, I was so glad to have the box on hand to use for different occasions, the cards in the box are simply beautiful, plan on ordering more once I run out of my box. great value! the cards are stunning and the boxes have soooo many. cheaper than buying at the pharmacy. I love the idea of having the perfect card for any occasion on hand. I hate shifting through countless cards to find the right message, and the card quality is usually not up to par. I will definitely be ordering an assortment box soon! Probably one of this best investments you can make. I’ve found myself in plenty situations where I forgot a anniversary or birthday, or just simply forgot to buy a card. I used to have a reputation in my family of sending out late cards no matter the occasion. Well not any more. Since I began ordering assortment boxes, my sullied reputation is a thing of the past.